Raucous comedy. Great tenderness. Muscular, powerful music. Simple folk ballads. Family, faith, metaphysics. 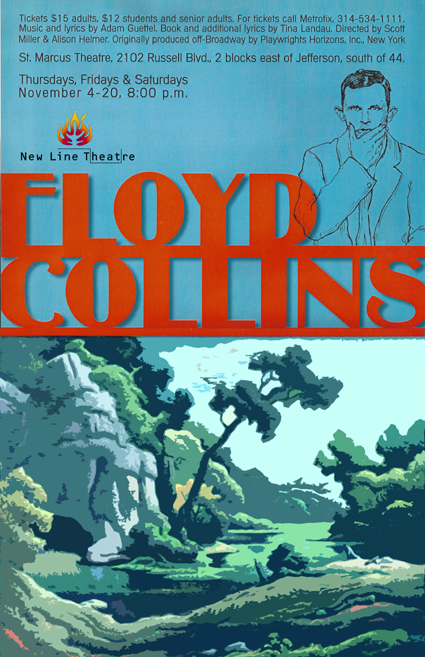 It's all there in Floyd Collins, one of the most spectacular first efforts in the history of musical theatre. With Floyd Collins, composer-lyricist Adam Guettel (rhymes with kettle) has clearly established himself as the most likely candidate to lead the next generation into the musical theatre terrain that Stephen Sondheim has explored for the last forty years. Floyd Collins is a musical full of a complexity and sophistication worthy of Sondheim, yet also full of the emotional force that this story demands; because, though it is a story about media exploitation, greed, glory, and prejudice, at its core, it is even more about family and faith. It is one of those musicals, like West Side Story, Company, and Ragtime, which could only have been written by Americans. There is a brashness, an openness, and a muscularity in Floyd Collins that is uniquely American. Guettel and his bookwriter Tina Landau have tackled a most unlikely subject for a musical. Most of the story takes place after Floyd has been trapped a hundred feet underground. How do you make a musical about a character who can't move? The answer is twofold. First, they realized the most compelling story here is an internal one; the almost supernatural connection between Floyd and Nellie, the powerful brotherly bond between Floyd and Homer, Floyd's indomitably American spirit, and his blind optimism in the face of incredible obstacles. Second, Guettel separated the two worlds – above ground and underground – by giving them each their own sound. Above ground, the music is an only slightly altered bluegrass Kentucky folk sound; rollicking, simple, honest. Below the surface is Floyd's world, and it has its own music. Here is where Guettel uses the sophisticated, complex sounds that owe something to the work of Stephen Sondheim; full of soaring, gorgeous melodies; unusual, quirky rhythms; and fascinating, interconnected musical themes that weave together to create a beautiful musical tapestry. Guettel and Landau have written a musical about a real American hero, still today considered the greatest cave explorer in American history. And they've done it with such care and such skill that it ends up being one of the greatest musicals you'll ever see. We just hope we've done this magnificent work justice. Several years after college I found myself far from the theatre, doing graphic design in a retail music store, when one of my coworkers, a former university music instructor, got a call from a local theatre company desperate to replace the lead in an upcoming production of Brigadoon. Aware of my background, he gave them my name; two weeks later I was performing my first role since college. That was the spark. Three more lead roles built my confidence enough that I sought out professional theatre companies, not for the money, but for the challenge. I was tired of being a big fish in a little pond, but the old fears returned. Was I good enough? I had to give it a shot, and another local actor suggested New Line Theatre. I knew nothing about them, but I trusted him and soon learned they were about to hold auditions for Floyd Collins. In my wildest dreams I never imagined a St. Louis company would take on a show this personal and this excruciatingly difficult. 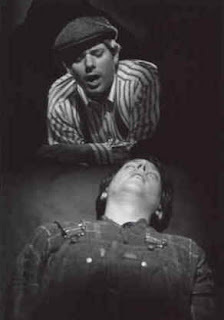 I clearly remember my only request on the audition form: “I just want to sing.” They cast me as Floyd, and, along with music director Neal Richardson, pushed me harder and farther than I ever dreamed. To this day I’m still shocked they had the guts to take on a show like this, but you have to realize New Line does it time and again over and over. Scott simply does what inspires him. It’s truly remarkable. The fact that he’s willing to cast someone he’s never seen before, and has the wherewithal to pull it off, astounds me. So, do I have what it takes? Who knows, that’s for others to decide, but I’ll never stop seeking out challenges and working hard. I have New Line Theatre to thank for this outlook, and Floyd Collins and many future productions to look forward to because of it. For me, the most wonderful moment of doing this show was standing backstage late in the second act while Floyd sings his last song and realizes he's going to die in the cave. For me, that was the emotional high point. When Troy would sing the line: “Will my mama be there waiting for me?” I would get shivers and have a huge lump in my throat the whole time I was saying my closing monologue. 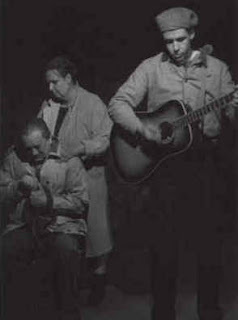 Floyd Collins was far and away the most touching show I've ever experienced. I will always cherish the memory. During the rehearsal process for Floyd Collins, Scott did a tremendous amount of research about this true story. In fact, Scott, Alison, Troy, and Amy traveled to Kentucky and saw the actual area where the show is set. They even brought back pictures and souvenirs of their trek to Floyd country. All of this reminded the cast that our characters were real people, and we got to know them a little better. But the biggest reminder happened on opening night. A group of actual cavers attended and sat in the front row with their cave helmets on. We thought that was kind of a strange thing to do and were poking fun at them backstage. During intermission, Scott talked to these folks and found out how much of a folk hero Floyd Collins is to cavers everywhere, even seventy-five years after his death. In a sense, it was like having friends of Floyd in the audience. That was pretty cool. Oh yeah, the cavers liked the show. I never want to yodel again in my life. I don't think Scott would ever be happy with music that was simple and easy. And because of this, I don't think his performers would either. I have wanted to try other theater groups, but I don't. I keep thinking, “But they won't be like New Line’s shows.” I believe in what Scott does and the education in theater that he has given me. Also [I’m thankful] for the wonderful opportunities for personal growth and growth as a performer. I can never be grateful enough for all the true friendships I have made through New Line. I am proud to say that I am a part of New Line and will always be. Thank you Scott Miller. It was in the fall of 1999. Floyd was upon us and I took the job as set designer. I tried different ideas. In a small theatre like St. Marcus, there isn't much room for anything extensive. So I had to wing it. I needed this unit set to be a cave, a forest, a gathering area. I knew it would get done. I just couldn't calculate how well. I was in a bit of a panic. I needed to catch a vacation. I needed to really focus. I took a trip to Springfield. I knew how the set would be built, but the detail was crucial. That first night in Springfield was to be the time of clarity. I lay on my back on my friend’s floor (a bit sauced), watching a candle flicker light on the ceiling. I felt something on my side. I look down to my chest, and in the little light that was in the room, I noticed two long antennae sweeping the air. I froze. “I hate cockroaches,” I thought. All the lights go on and my friend is grabbing a shoe to kill this bug. In a flash, I realized what was on me... a cricket! I shouted, “No! Don’t kill it!” Floyd talked to crickets! It jumped off of me and disappeared into the house. In the instant I saw that cricket, I saw the detail of the set. In my head it was complete (crazy, huh?). That was a great spiritual moment for me. I believe in many Eastern beliefs and one belief is that crickets are fortune tellers, prognosticators. I had a moment of connection with something else, somewhere else. And the energy used me to create the right set. It turned out to be one of my favorite works of art to date. (Thank you, Mark, for the perfect lighting.) Floyd and my time doing that show really helped me deal with problems I had been struggling with, [helped me] shine in the face of adversity. During rehearsals for Floyd Collins, Troy, Alison, and I drove to Kentucky to see Floyd’s cave. The lady at the Floyd Collins Museum told us where the cave was in which Floyd had been trapped. We drove down the road and found a small sign by the side that said “Sand Cave.” There were no arrows, no map, no directions. We started down the dirt path, and after a few wrong turns, we finally found it – Floyd Collins’ Sand Cave, where Floyd was trapped and died, where people had argued over rescue theories, where thousands of gawkers and onlookers had assembled seventy-four years before. We found the tiny passage through which Floyd had squeezed. It was utterly magical and emotionally overwhelming. I felt like I was about to cry. I couldn’t believe we were there. It was the feeling you get standing in a beautiful cathedral. We then drove up the road further to find Floyd’s grave, and an elderly couple who had been driving by stopped when they saw us in the graveyard. The man had been a cave guide many years before and had carried Floyd’s coffin when they had moved it to that cemetery. They told us so many great stories and then told us how to find the unmarked Crystal Cave, which Floyd had opened to the public before his death in 1925. The next day, we found the small dirt road they had described, behind a locked gate. We parked and walked several miles down this road, not knowing for sure if it was even the right road. We found a couple buildings which we thought might be a house and a ticket office Floyd had built. While Alison and Troy took pictures, I found a path and ventured down it. I came across homemade stairs and a railing leading down to an entrance into a hill. I had found Crystal Cave and I screamed myself hoarse running back up to them. The entrance was sealed behind a big iron door, but when Troy pushed on the door, it opened, and to our great surprise we were able to walk inside the first chamber of Floyd’s cave, to stand on the floor he had smoothed, to breathe the air he had once breathed. It was an experience I’ll never forget. What I remember most about the show is reuniting with Scott, and working with him for the first time in years. Whenever I've worked with Scott, it's always been an educational experience for me because he is so knowledgeable about the material he covers for any show he does. This was the first musical I had done since I graduated college. Since then I have concentrated mostly on music-writing, singing, and acting from time to time in various film and TV projects. So this was a welcome change of pace for me, as well as a sort of homecoming, since the musical stage is my first love. I remember everyone involved in Floyd Collins being a bit overwhelmed at first by the complexity of the material. Not just the score, but the story behind it too. This show is also a fine example of the type of material that Scott chooses for New Line, and why I believe the company has survived, and will thrive in the many years to come. New Line's productions do more than entertain people like other theatre companies or shows, where you leave the theatre afterwards, and within fifteen minutes forget what you just saw. New Line challenges the audience, and gives the audience something to think about after they leave the theatre. I'm not familiar with many other theatre companies, besides perhaps the Steppenwolf Theatre Company in Chicago, that sets the bar so high in the choosing and executing of material, whether it's a popular classic, a lesser known piece, or a world premiere of an original work; where the result is a growing and learning experience for the artists onstage and behind the scenes as well as quality entertainment for the audience. Here's to ten--and hopefully many more--years for New Line! I hope that I'm lucky enough to be a part of your process again and again in the future. Not so very happy but it surely is brave. Brave theatre. Dissonant music. Hard to understand. And he doesn’t move a muscle for the rest of the night. Long night. Just sits there. No choreography. All in all, about as fun as choppin' off your toe. A-weepin' and a-wailin' where the comedy belongs. Just a joke or two. That's all we ask. And sure, by the end, well, the hero will be dead.